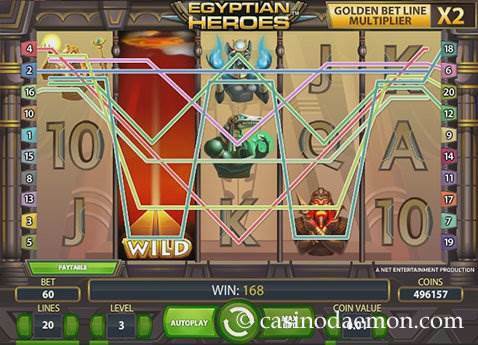 Egyptian Heroes from Netent is an Egypt-themed slot with beautiful graphics and interesting game mechanics. You will find yourself inside a tomb where you can find valuable treasures. The game doesn't have a background music, and the sound effects when you spin the reels also don't fit the theme, however, the game-play is what makes this game interesting, and you might want to play without music anyway. The slot features the Golden Bet Line with multipliers, up to 20 free spins and wild substitutions. The variance of the slot is medium to high. You will find that most game rounds you win the amount is lower, but once you get a win on a Golden Bet Line or you manage to trigger the free spins, it can be really worth your while. The theoretical return to player is 93.8% to 96.7%, depending on how many pay-lines you activate. 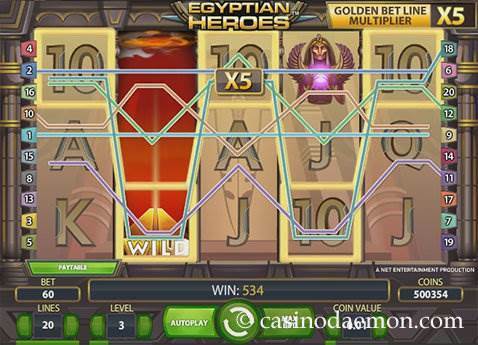 Unfortunately, you cannot play Egyptian Heroes mobile on the go, as the game is not optimised for mobile casinos. You can play Egyptian Heroes for free here, and try it without risking any money. If you like it you can play it for real money at one of the online casinos listed on this page. When you click on the spin button you will see a golden line appear on the screen. This is a randomly chosen bet line that will have a multiplier of x2 - x5. When you get a winning combination on this particular pay-line the multiplier will apply to the winnings of that line. The game also has a pyramid wild symbol that can stand in for all other symbols to create winning combinations, but it cannot replace the scatter symbol for the free spins. You can get 10, 15 or 20 free spins with 3, 4 or 5 scatter symbols. During the free spins you will also get an expanded wild symbol on the centre reel and it will remain there for the duration of the free spins. Other wild symbols that can appear on reels 2 and 4 will also expand and create better paying combinations. 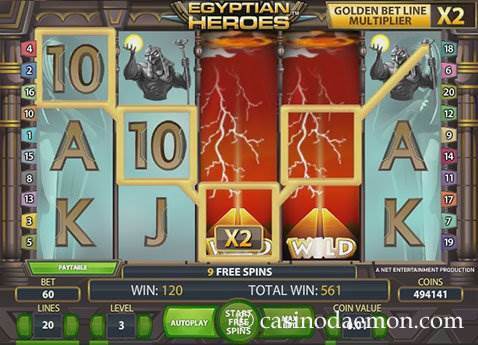 The Egyptian Heroes slot from Netent has 5 reels and 20 pay-lines that can be individually selected. However, keep in mind that the theoretical return to player is lower when not all pay-lines are played, and we therefore recommend that you play all 20 lines. The coin values start at 0.01 and can reach 0.50 £/$/€. You can also select to play up to 10 coins per line. The minimum wager is 0.01 £/$/€ and the maximum you can play in one spin is 100 £/$/€. 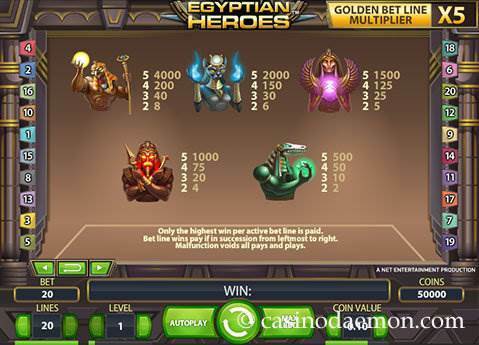 The maximum line win is 4.000 coins, when you manage to get Horus 5 times on a pay-line, and the amount is multiplied depending on the selected bet level.